Criticism is especially uncomfortable when it’s in the form of a review...from a guest...about the food and/or service at your restaurant that you've worked so hard to perfect. You know this truth by now - bad restaurant reviews are real. And they can hurt. You’ve worked tirelessly to make your restaurant what it is today. Maybe you’ve even put years of work into the menu - or a lifetime. Imagine it’s the the middle of a Tuesday and you’ve been making pasta all day. You check your reviews and a guest criticizes your Italian restaurant on a TripAdvisor (after you’ve just made pasta all day). 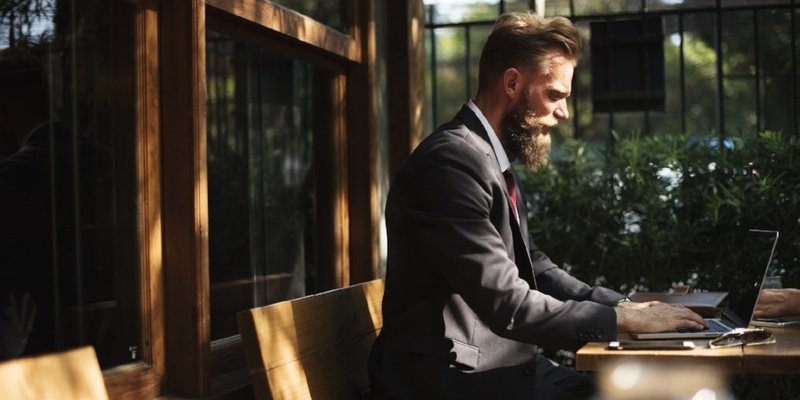 When in the form of a review, despite its pains, negative feedback is one of your key tools to improving areas of your restaurant such as operations, food, and service. To understand how reviews provide key insights into the customer experience, let’s take a look at eight negative reviews and the lessons restaurants can learn from them. Although there are positive reviews on the restaurant’s Yelp page about the service and food, the reviewer writes about long the wait times and his dissatisfaction with his meal. The restaurant should take the advice of the reviewer, especially if there is a trend within the reviews talking about salty meat. Who knows? Maybe there's a trigger happy chef in the back with an extra large salt shaker that needs to be restrained to avoid further bad reviews. Conversely, if positive reviews consistently highlight one ingredient as particularly great, try incorporating that taste into more dishes. This reviewer didn't even know what they were eating! Jamie J enjoyed the live band, but the food ruined the overall experience. “We had a buffet dinner, which was not good and don’t bother if you’re a vegetarian,” Jamie writes. If Jamie is upset that vegetarian options are limited (or if it’s difficult to decipher exactly what food is on your plate), then other guests are probably feeling the same way. If you want to appeal to more people, consider offering more food options based on dietary restrictions. This strategy is appropriate for a large venue hall like the one Jamie reviewed, but if you are aiming to be great at one thing, stick to it. If you want to be your city's best steak house, don't worry too much about your vegetarian options. And - needless to say - be sure guests know what kind of food you are serving if there’s a buffet. It sounds like the issues can be fixed right away. She is telling the restaurant exactly what to change. Make the dim sum with fresh ingredients. Serve the chicken promptly so that it's hot. Sol san and Jeri both said in the past the restaurant provided a better overall experience. Recognizing that this issue is being experienced by more than one formerly satisfied guests, this is a wake up for this call to change now or else receive more bad restaurant reviews. How can the owners improve the restaurant? Perhaps the food can be sourced locally to remain fresh. Since the restaurant seemed to have better days, maybe hiring a restaurant consultant would be their best bet. High-end restaurants are known for charging more for higher quality offerings and an unbeatable dining experience. Nothing wrong with that! However, remember that menu prices marked up too much could result in a negative experience for your guests if they're not pulling in a seven figure sum. This restaurant, for example, could add a bottle of wine for under $100. “If they do not want to let the public enjoy a decent bottle at say, $80, well done,” the reviewer writes. Response Strategy: If there is a reason the restaurant owner keeps the wine prices at $100 a bottle or more, it is best to reply to the guest and let him know you will contact him directly (as you should do for any negative review). Maybe your trusted sommelier suggests only the best wine to compliment the food, and so to offer a bottle of wine under $100 could tarnish your menu or your reputation. Respond to all reviews, and contact the reviewer directly to take the conversation offline when there is an issue. Here is one review of a restaurant by a patron who had a slew of complaints. "Overall a very mediocre place." If I received a review like this, I might crawl into a hole. But Thomas, the business manager of the restaurant, took it well and responded respectfully. 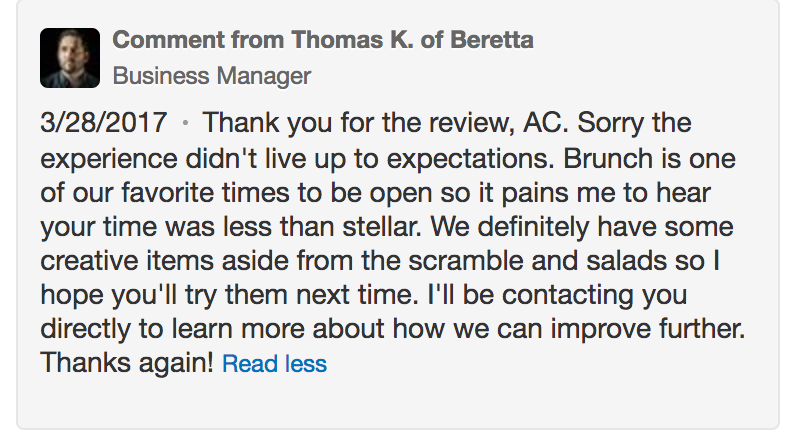 The highlights of his response: Thomas thanks the reviewer and apologizes for the less-than-satisfactory experience. He also tells the guest that he’ll contact her directly about the issue. He also mentions that the guest should come back and try other food items. This response shows that restaurant cares and appreciates its guests, which is important for both the usatisfied guest and potential guests (AKA consumers who are online researching restaurants). 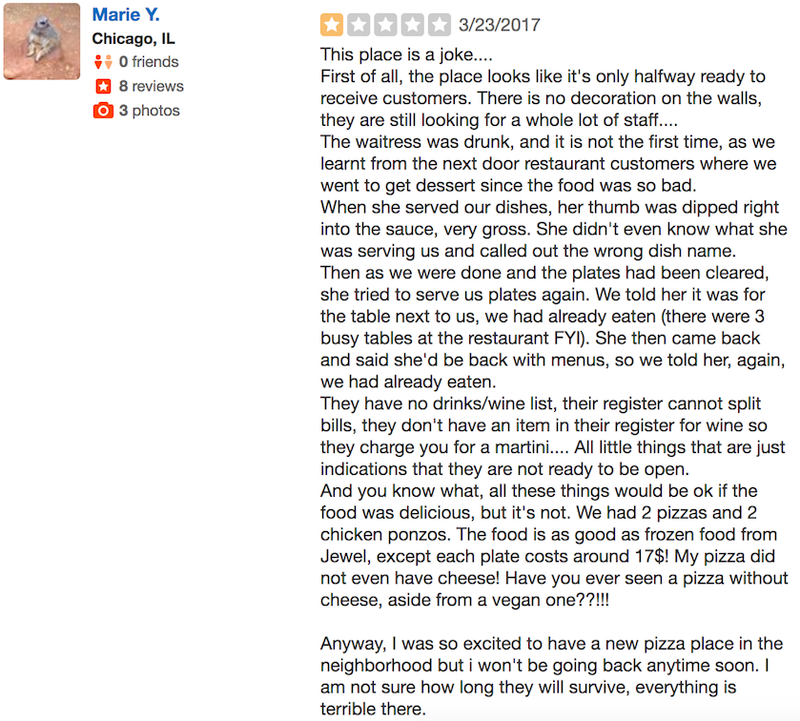 Despite starting with "This place is a joke," this review is actually an invaluable resource for the restaurant. There are so many details about the negative experience had by this guest - details that one can analyze and use to improve the guest experience. This reviewer claims that the waitress had too much to drink and that she “dipped” her thumb into the guests’ food. If I were this owner, I would follow up with the guest, find out who served Marie that day, and take action. If you uncover a pattern of issues, you may have to answer some important questions. For example, has the staff been trained properly? Your staff is responsible for creating a positive experience for your guests with proper training. As mentioned in the first lesson, look at the patterns within the reviews. “The food is as good as frozen food from Jewel,” Marie writes. Not too friendly. To reiterate: train your servers well. A powerful way to to make your restaurant shine is to focus on customer service. “Rude hostesses, pushy servers who leave you waiting. Bad, bad, bad I won’t be back,” Fabi D. writes. The service at this restaurant falls below this guest’s expectations in more than one way. Don't let this be your restaurant. There was an issue with the bill and the manager was rude, according to this guest. No matter how busy the restaurant, managers and waiters should always treat guests with respect. This review could have been three or four stars if the issue of the bill were handled in a positive way. Courtesy from all representatives of your restaurant at all stages of the dining experience. Keep it friendly, no matter how busy it gets! The guest experience begins before the customer walks through the doors of your restaurant. The reviews posted on your restaurant’s review sites (both positive and negative) are an important research tool for customers. Guests will read reviews and make their decisions based on both positive and negative reviews. That’s one reason why it’s important to have many reviews on your review sites: so that customers can read a variety of opinions about your restaurant. The lessons you can learn from reviews are important for the success of your restaurant. The customer experience, which can be understood and improved by with insights from customer feedback, should continue to be redesigned based on continuous guest feedback.